Pharmacology and clinical pharmacology define the desirable and undesirable effects of drugs and xenobiotics whereas pharmacokinetics defines the various processes that are involved in absorption - distribution - elimination of these agents. Needless to say that the former may strongly influence the latter. The kidney and the liver have complementary functions in the elimination of drugs and xenobiotics. Lipophilic non-ionic substances of molecular weight higher than 300-500 dalton and highly bound to proteins appear to be eliminated by the liver, while the kidney prefers hydrophilic substances of molecular weight smaller than approximately 500 daltons. Metabolism occurs predominantly in the liver, transforming the original substance into more polar and more hydrophilic metabolites, which became dependent on the kidney for elimination. Consequently, the majority of all drugs and xenobiotics in one way or another have to pass through the kidney. 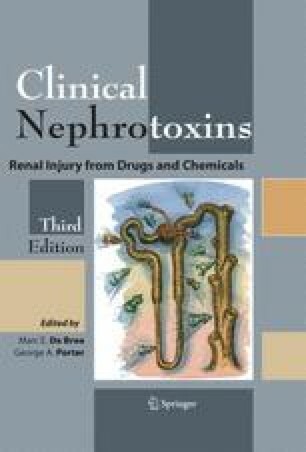 In addition to this important “gateway” function of substances, which are not always without side-effects, the kidney itself is particularly sensitive to drugs and xenobiotics.